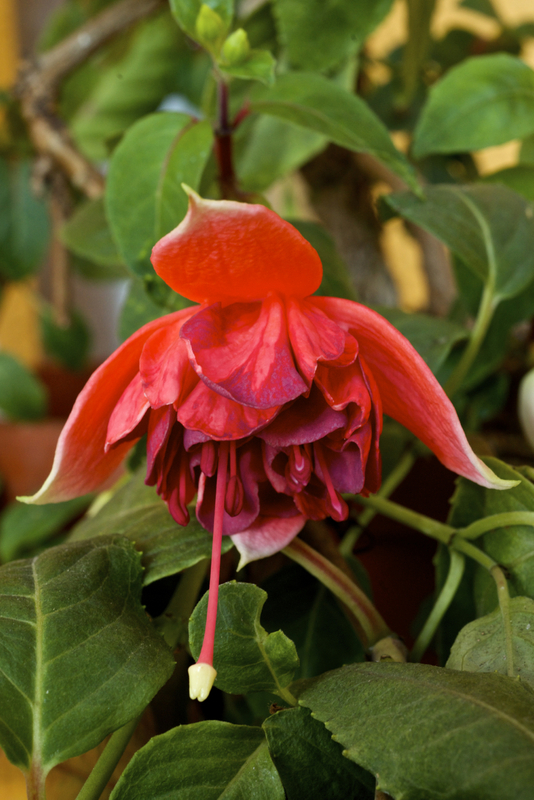 Home » Fuchsia of the week » ‘Ann G.’ is the Fuchsia of the Week 17/2015. Crossbreeding the Hybrids “Manfried Kleinau” and “First Lord” the result is “Ann G”, listed in 2008 with the “Keuringskommissie” in Belgium. This is a beauty to my liking: middle sized double blossoms, resistant to direct sunlight and blossoming in abundance from June through October. The color is in my opinion fascinating: the salmon-colored sepals show light green tips, and the petals with the same color will give sight to corollas in titian red while opening; an unusual combination, with a glorious result. The growth of the hybrid is semi-hanging. It branches out quite good, but does grow somehow slowly. Therefore it might be cultivated within the same pot in the same place if given enough fertilizer. I do that while watering continuously from April through August. There is no pest-problem, but it is regularly visited from innocuous insects. I picked this hybrid though i am visiting the Nursery Michiels this week. It may be otherwise obtained at Fuchsiengärtnerei Guttmann in Vienna. This is a perfect time to travel to Belgium to visit the Royal Greenhouses in Laaken. And 3 weeks later i will do a short trip to the Lake Neusiedl close to Vienna. This is a good possibility to link some short vacations with my FuchsiaMania!